"I used to run home to watch Dark Shadows" is among the show's most popular myths. That's not to suggest kids didn't run home to watch DARK SHADOWS. It had a huge following among children and teens, who were often at odds with their favorite show's scheduling. 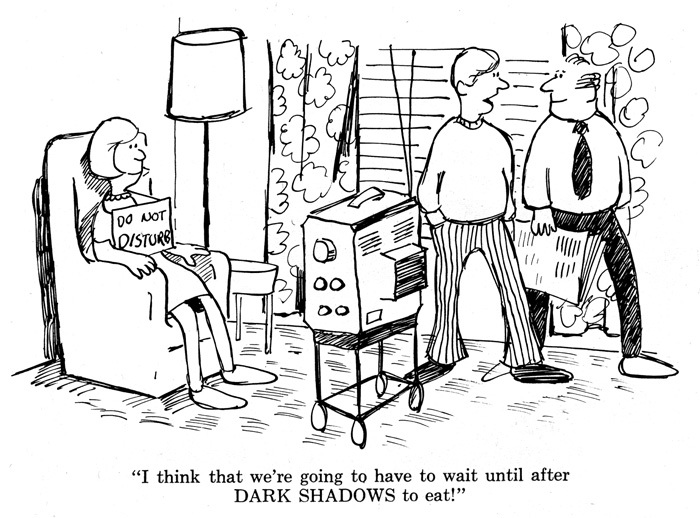 ABC and its local affiliates had a maddening habit of giving the show whatever time slots worked best for their own interests ... and those interests sometimes involved not airing DARK SHADOWS at all. Most affiliates opted to show DARK SHADOWS during the hours immediately after school ended, which seems like an obvious (and rational) method of hitting their demographic sweet spot. Depending on the market, though, there were mitigating factors behind the scenes affecting local schedules ... and these factors sometimes had nothing to do with meeting an audience's needs. "The ghouls, goblins and, well, a couple of hams will be off the air for a little while," wrote Martin Hogan Jr., of The Cincinnati Enquirer, on Jan. 16, 1969. "Channel 12 is dropping 'Dark Shadows,' but negotiations are in progress between WXIX-TV, channel 19, and the American Broadcasting Co., for channel 19 to pick up the show in prime time." WKRC-TV had opted to drop delayed telecasts of both DARK SHADOWS and ONE LIFE TO LIVE as of Jan. 27 that year because ABC prohibited the practice. ABC had been broadcasting DARK SHADOWS at 3:30 p.m., but the channel had been delaying the program until 9 a.m. the following day, a practice the network has problems with. While the idea sounded intriguing, DARK SHADOWS never made the leap in Ohio to prime time. ABC decided it didn't want its own programs competing against each other in the same time slot. 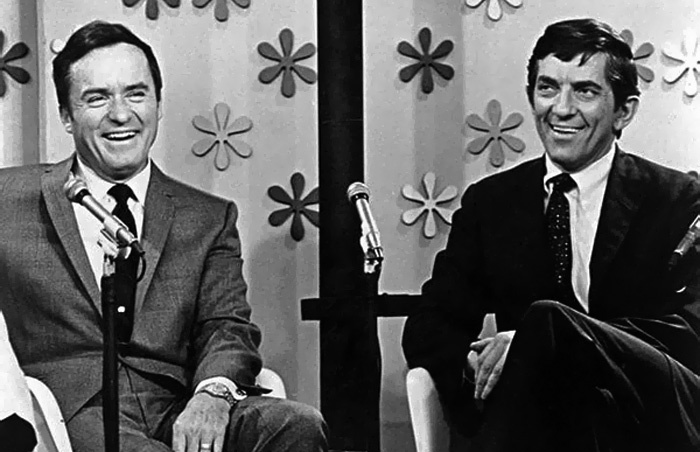 The delayed telecast was prompted because of the channel's long-term commitment to THE MIKE DOUGLAS SHOW, which had taken up residence in DARK SHADOWS' former time slot of 3:30 p.m.
"You should have killed me when you had the chance, Frid." By the tone of Hoffman's responses to the final batch of published letters, he was fed up with discussing DARK SHADOWS "Apparently, the 'faithful followers' aren't a large enough group to count because a high rating would reflect a multitude of 'faithful followers,'" he snarkily told one reader. Hoffman's responses are hilariously trollish. I've posted his full discourse with DARK SHADOWS fans over at Tumblr for your amusement. You can read them HERE. In early 1969, DARK SHADOWS was beginning to have trouble down South. WWAY-TV in Wilmington, N.C, moved the show to wildly differing time slots in hopes of finding a home for the troublesome Collins clan. 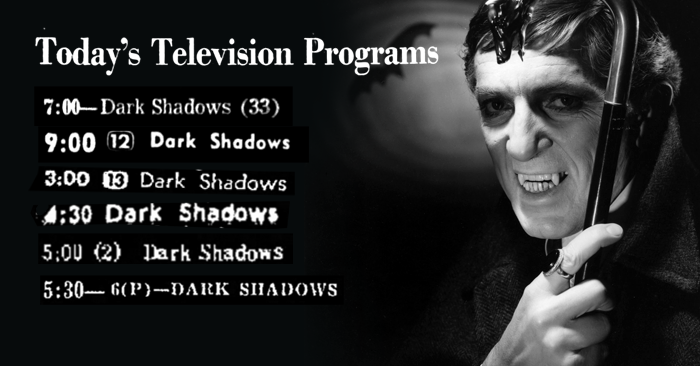 First, the station shuffled DARK SHADOWS from 4 p.m. to its block of morning programming. This change lasted all of a week: The station was reportedly hit with 5,000 hand-written complaints (i.e. "letters") from viewers, prompting them to move the show to 5 p.m. In Michigan that year, things were even more complicated. Once again, Mike Douglas was a factor in the decision by WXYZ-TV to move the show from 4:30 p.m. to the student-unfriendly 3:30 p.m. But Mike wasn't the only roadblock, explained exasperated syndicated columnist Bettelou Peterson. "The biggest problem, as we've tried to explain, is that Michigan voted, by a narrow margin, to stay on standard time while the rest of the country went to daylight savings time," she wrote in May, 1969. "Detroit stations tape evening shows so that can be run an hour later in Detroit than on the network. It costs too much money to do the same for all daytime network shows. This is one case where you can't blame TV, blame standard time supporters." As a consolation, WXYZ-TV made written synopses of DARK SHADOWS episodes available to fans. An initiative measure was passed by Michigan voters in 1972 that repealed the state's exemption statute, if you're interested in how that problem resolved itself. 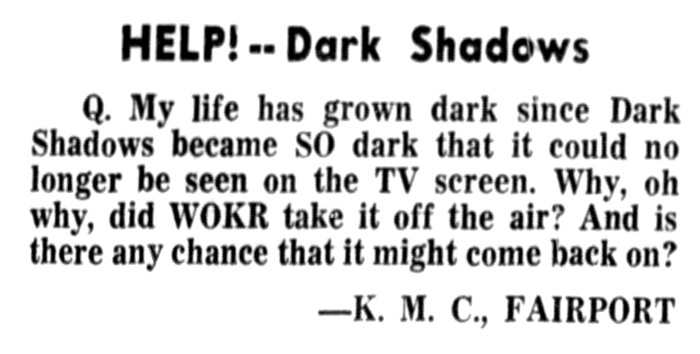 Later in New York in 1969, Mike Douglas cannibalized the DARK SHADOWS time slot at WOKR, but this time it wasn't because of contractual reasons. WOKR had received complaints about the show's "morbid" nature and decided that "viewer composition for the show was not compatible with programming preceding and following." DARK SHADOWS was just too violent and scary. Once Mike Douglas was moved into the former DARK SHADOWS time slot on WOKR, he was bracketed on either side by ONE LIFE TO LIFE and THE BIG VALLEY. There was some chatter about revisiting the decision to cancel the series, but I could find no evidence that the show ever returned to the station's schedule. DARK SHADOWS continued to air in 1969 on WNYS in Syracuse, N.Y., followed at 4:30 p.m. by STRANGE PARADISE, a Canadian DARK SHADOWS ripoff with a few creative ties to its "inspiration." ABC's inability to reserve a consistent time slot for DARK SHADOWS is probably something to take into consideration in future discussions about the demise of the series. Television real estate is perennially expensive and, even as the producer of one of daytime's most popular shows, Dan Curtis lacked the clout with ABC to fend off these kinds of assaults.